There is an evil on the rise and only a brave few will be able to stop it. The world of SMOG is the creation of talented artist Christophe Madura, and it was first seen in game form with the 56mm miniatures of Smart Max’s SMOG The Thirteenth Hour. CMON was smart to grab the licence and the designs, translate the figures back to normal game scale, and create this gem of a game. 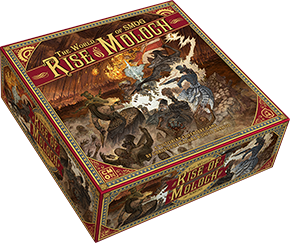 The World of SMOG: Rise of Moloch is an extremely well done skirmish-level boardgame, broken into a campaign of 6 chapters. Extra expansions pad the game out with all the extra figures and story and characters you could possibly want (well, for a long time anyway). We’ve all seen this kind of one vs many game before – in this case most of the players are the ‘Gentlemen’ (the rulebook takes pains to point out this is a non-gender-specific honorific) of the Unicorn Club, versus one player controlling the agents and minions of the nefarious Nemesis. And personally I’m a bit tired of that style of play. But in this case it all works so well. As the Nemesis, rather than feeling you should go easy on the players to increase their enjoyment, it does feel like a relatively balanced struggle, and all the games I’ve played have been close and exciting. The game positively exudes theme, with an amusing and fascinating mix of items, weapons and strange characters. And a simple mechanic – when gentlemen use ‘ether’ to power their abilities and weapons, they must pass it to the Nemesis, who can then power their abilities – sets up a tense ‘push-me-pull-you’ between the two sides of the contest. The scenarios are excellent too, and full of variety that continually keeps the game fresh. I’ve almost finished the core campaign for the second time, and still have boxes of extra scenarios to enjoy. Though I do think the translated scenario introductory text is some of the most jaw-distortingly bizarre prose ever committed to paper, even it kind of works – in a weird way. Hopefully CMON will make the entire line available at retail, because this is a game that deserves more attention, and one of CMON’s best.